Copper Compound Conundrum Part 3: Testing the Precipitate - the exciting conclusion! 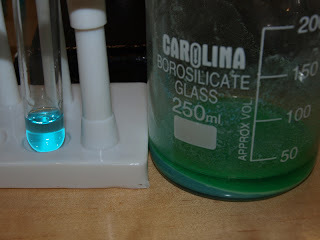 Now that I had determined the identity of the solution, it was time to figure out what the blue precipitate was. Remember from Part 2, this is what my mystery concoction looked like (in the beaker on the right). After performing step 3 and filtering and drying the precipitate, I ended up with a dark green powder which was likely a mix of copper(II) hydroxide, oxide, and carbonate. All three of these compounds should react with sulfuric acid to form copper sulfate, so I figured I'd go ahead with the last step in my video's reaction scheme anyway. I should have ended up dissolving all the solids into a nice blue solution of copper sulfate like I started with. Here's what actually happened. If you've been following my blog, you've probably realized I like to write a lot. Well this one's no exception. I like to provide as much detail as possible so others can replicate my results and in reading it get the same enjoyment out of the experience as I did (hopefully). Enjoy! In the process of filming a new video on copper compounds for my channel, I ran across a bit of a snag that ended up taking me down a different path that was both fun and instructive.